Quoddy Head Lighthouse overlooking the Bay of Fundy and Grand Manan Island. Lubec, Maine, is best known for being the easternmost town in the contiguous United States. A small town of under 2,000 people, Lubec was first settled in 1775. Its ice-free harbor facilitated a remarkable smuggling trade in the early 19th century, and the town later became known for its agricultural industry, shipyards, tanneries, gristmills, and sawmills. Together with nearby Trescott, Whiting and Campobello Island, Lubec is an excellent destination for a relaxing, beautiful vacation. Lubec’s topography includes four peninsulas between the Lubec Channel, Lubec Narrows, Johnson’s Bay, Straight Bay, and Passamaquoddy Bay. Its unique geography makes Lubec a place of immense natural beauty and has made the ocean part of everyday life. Lighthouse lovers will appreciate a visit to Lubec, which has five lighthouses in its surrounding area. 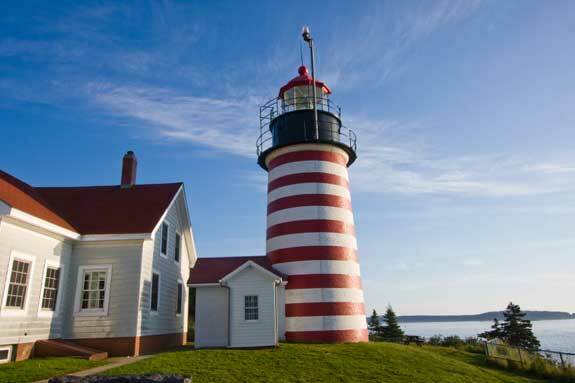 The West Quoddy Head Lighthouse is located at the easternmost point in the United States, making it a popular place for visitors to watch the sun rise. Congress authorized the construction of the lighthouse in 1806 to protect passing ships from Lubec’s rocky shores; the current tower was built in 1858. Although the lighthouse tower itself is not open to the public, the West Quoddy Head Light Keepers Association maintains a visitor’s center and lighthouse museum, which are open during the summer months. Other nearby lighthouses include Lubec Channel Light in Lubec, East Quoddy Light in Campobello, Mulholland Point Light in Campobello, and Little River Light in Cutler. Several small museums call Lubec home. The Lubec Historical Society presents rotating exhibits throughout the year at Annabell’s Sea Flea Shop. These exhibits highlights Lubec’s past as a shipbuilding hub and important port. The local fire station hosts the Robert S. Peacock Fire Museum. This museum features a hand-propelled water pumper acquired in 1889, a hand tub, and other historic fire-fighting equipment. The McCurdy Smokehouse is no longer in business but was placed on the National Register of Historic Places in 1993. In the 19th and early 20th century, Lubec was a bustling fishing community. The McCurdy Smokehouse was the last commercial smokehouse operating in the United States. The facility was used to smoke herring, which was shipped across the country. Each May, Lubec hosts the Downeast Spring Birding Festival. Ornithology enthusiasts from across the nation come to the area to catch a glimpse of migrating and nesting birds. Lubec features diverse habitats, including boreal forests, northern hardwood forests, freshwater marshes, saltwater marshes, bogs, grassy fields, tidal flats, coastal islands, steep headlands, stream, lakes, and shrubby fields. These ecosystems harbor over 300 species of birds. Lubec also hosts the Passamaquoddy Yacht Club’s Annual Roosevelt Cup Challenge. Open to all sailboat racing vessels greater than 12 feet long, this two-day race is free to enter. Each year, Lubec is also the of the easternmost 10k race in the United States. Lubec’s proximity to the Bay of Fundy and smaller coves make it popular among sailing, boating, and fishing enthusiasts. Although much of the eastern seaboard has become overcrowded, Lubec has retained its serene, tranquil natural beauty. The Cobscook Bay area offers miles of shoreline, secluded tidal inlets, and rustling pine forests. Kayakers will enjoy exploring the coves and rocky islands dotting the bays surrounding Lubec. The small town of Whiting, located at the southern end of Whiting Bay, is another popular location for kayakers because of its proximity to the sea, freshwater streams, and clear lakes. Quoddy Head State Park is located just south of Lubec. In addition to its famous lighthouse, this park features extensive forests, several bogs, unique habitats with rare plants, and miles of hiking trails. Consider camping in the park for a remote wilderness experience that you’ll never forget. No matter where you stay in Lubec, you will never be far from the fresh sea air. From humble campgrounds to grand estates owned by former sea captains, Lubec has a wide variety of lodging options. Many vacation rentals are available, giving you the opportunity to rent a waterfront property for your getaway. Look for Lubec’s historic inns, charming bed-and-breakfasts, or budget-friendly motels. The town offers a range of dining options, from fine dining establishments featuring fresh Maine seafood to cafes, taverns, and family restaurants. Campobello Island, part of New Brunswick, is a short drive from Lubec. You’ll need your passport to cross the bridge into Canada. Roosevelt Campobello International Park is a popular tourist destination on the island. Franklin Delano Roosevelt spent summer vacations in this area, and his 34-room estate remains at the park today. After viewing Roosevelt’s cottage and exploring the visitor center, consider hiking on the park’s miles of trails. If you would like to take a trip elsewhere in New Brunswick, the Quoddy Loop Ferry departs from Campobello Island. Note that these ferries operate on Atlantic Time, one hour ahead of Eastern Time. Visitors to Campobello Island may stay at the historic Owen House. Originally built by Admiral William Fitzwilliam Owen in 1835, this home has been converted to a bed-and-breakfast. It is widely appreciated for its historic value as well as its spectacular views. Visit the following directories to find lodging, dining, attractions, shops, services and recreational activities in the Lubec, Maine area.